This three-piece knife set has a distinguished, executive look and feel with its three handsome knives. Each knife has a stainless steel blade with an attractive satin finish, elegant wooden handles and stylish scrollwork etchings on its bolsters. It comes with a decorative display tin that only adds to the appeal. Although I bought this for myself it would make a great gift for the right person. It makes an excellent display piece but all of the knives feel very sturdy and usable. Very handsome design. TIP: The Timber Wolf gentleman's lock back knife on clearance for $6.98 Matches the set perfectly if you want to add another blade to the collection. 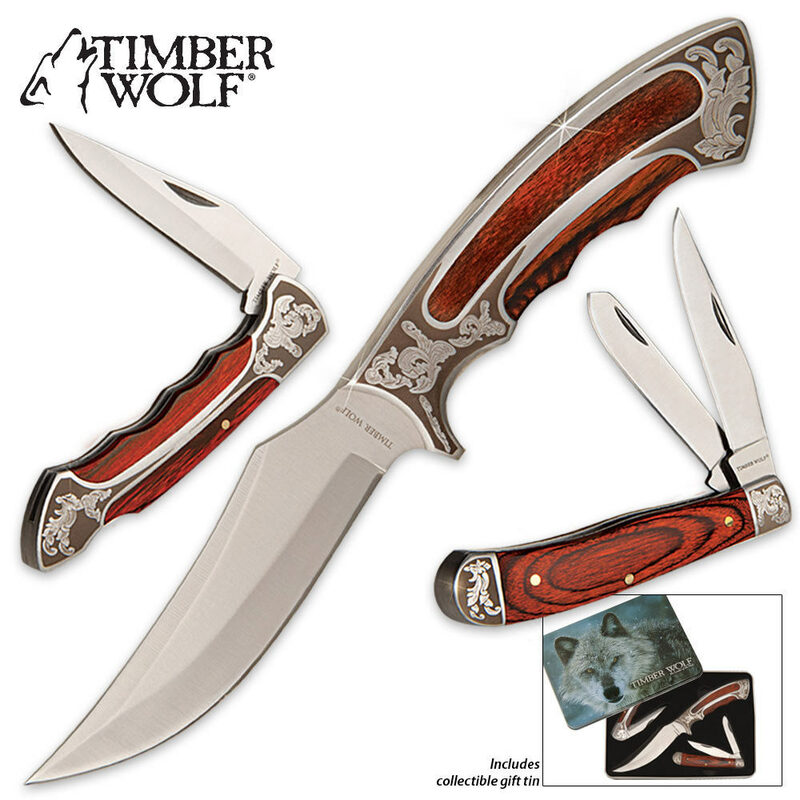 I wish it came with a sheath for the fixed blade but there's no way I'm docking it a Star for that as it is still an awesome deal. It's a pretty standard blade...if you're shopping on this site you probably have something lying around that will work. I definitely recommend. All three are great. Blades are fairly sharp but could use sharpening, and visually these knives are very good looking. For the price, this was an amazing value! Definitely not disappointed! I got this set for my birthday three years ago, and all three knives have held up outstandingly! The only thing I wish is that it came with a sheath, but I bought a good quality one for it. I've read a review or two about the square handle, and how it doesn't feel good in the hand, but it feels great in my hand. Thanks BudK! I was very impressed on the quality and have purchased more because of it and will continue because of the trust they have earned with me !!! !THANK YOU !!! What can I say? A great set of knives for a great price! I really like the dagger most. The knives re greatly built, the pocket knives are average knives, nothing special but no flaws, the fixed blade is built really good, but the steel AUS6 is a steel used often by cheap knife makers in japan and china, the knives after all are made in china.